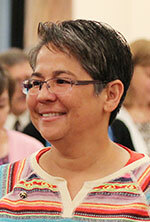 Providence Sister Joni Luna professed her first vows on June 26. She entered the congregation in 2012. In 2014, she began her two-year novitiate. She is still in the initial formation process. Prior to entering the congregation, Sister Joni lived in Texas, where she grew up. During the first year of her novitiate, Sister Joni focused on studying Scripture and spirituality and participating more deliberately in communal and private prayer, while continuing the discernment process of the call to religious life through a variety of programs, seminars and other projects. The second year of the novitiate is referred to as the mission novice year. Novices live the everyday life of a fully professed sister during this time, but they have not yet professed vows as a member of the congregation. During her mission year, Sister Joni ministered as the assistant principal at St. Patrick School in Terre Haute.